When it comes to handling a fire in our homes, we know it can be devastating. It can take time to sift through what is left and begin rebuilding the home once again. If you home or business has recently had a fire, and you are now in need of fire damage restoration services in Corona, then it’s time to call the professionals at SM Absolute. We know exactly what it takes to clear away the damage and put your home back to the way it was before, without all the soot and smoke smell. 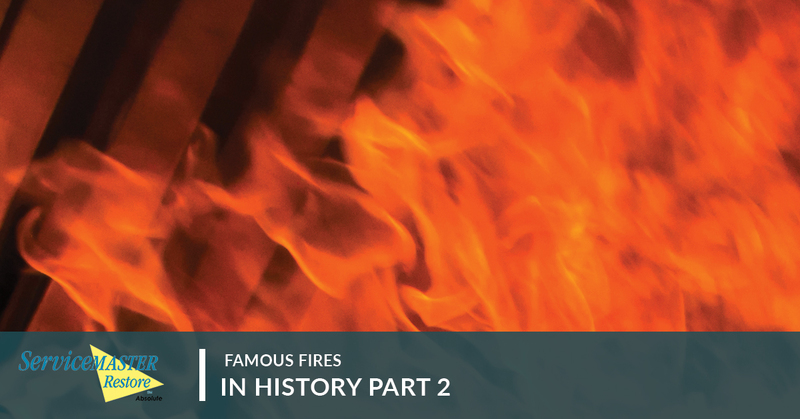 In one of our previous blog posts, we talked about three of some of the most famous fires from history. Today, we are going to share more stories like the ones in part one. Let’s be thankful fire laws and safety precautions have changed for the better! This club was not located in Beverly Hills; in fact, it was actually located in Kentucky just six miles sound of Cincinnati, OH. This was a center of entertainment for people who wanted to feel the Las Vegas or Atlantic City performance experience closer to home. However, the place was neglected when it came to fire codes. The carpets and seat cushions were all flammable, and they let off toxic fumes when burned. There were no fire doors at the tops of the stairways, and the architect who designed the majority of the building was not licensed in the state. Most of the building also relied on aluminum wiring, which is another fire hazard. While the actual cause of the fire is still unknown, we do know that there were guests who were leaving a wedding reception who complained that the place was very warm. They closed the room after the guests left, only to find it filled with smoke hours later. A busboy who saw the fire warned people throughout the building. When he interrupted a comedy show to warn the patrons of the fire, many people thought he was part of the act and did not move. Two minutes later, the room was filled with smoke and fire with toxic fumes. Firefighters had a hard time entering because so many bodies were stacked in front of the doors; 165 people lost their lives. Because of this fire, aluminum wiring was banned, emergency lighting became required, and non-toxic fabric coverings were required for seats and floors. In west Warwick, Rhode Island, a heavy metal nightclub called The Station was hosting the band Great White. Unfortunately, the foam soundproofing material that lined the stage was flammable, and the band’s manager neglected to get a pyrotechnics permit before the show. To top it all off, the building was made of wood, and was built before 1976. This meant that it was built before ceiling extinguishers became part of the law. Once Great White took the stage, small sparks meant for show caught the soundproofing material and quickly burst into flames. The singer, Jack Russell, said, “This ain’t good” to the crowd before quickly leaving the stage. Most of the audience didn’t move until it became apparent that the fire was unintentional. Since there were no sprinklers present in the ceiling, 100 people lost their lives in that fire. The band manager and the two building managers were charged with involuntary manslaughter. As a result of this, all public buildings, regardless of when they were built, were forced to install ceiling sprinklers. We hope that your fire is not as serious as these famous fires, as safety regulations have dramatically increased over the years. Even today, new regulations are being made to keep all those in large occupancy buildings safe from harm. However, if you have suffered fire damage in your home, and you are now in need of fire damage restoration services, it’s time to call SM Absolute. We look forward to clearing away all signs of fire from your home or business. Contact us today and see what our team of professionals can do to help you bring your home or business back to the way it was before. We are proud to serve the San Diego area, and we can be there that very same day to begin work.